As a member of the media I get to see many ultra cool items while attending the Consumers Electronics Show, all sorts of gadgets and gizmos that would make the most geeky of geeks head spin. Most products are solid offerings as it’s not cheap to attend the largest electronics show in the world. This year one product stood out, and has the potential to change the looks and feel of the global economic landscape. driven around town and on short commutes. I say short, because the maximum range with the current battery system is approximately 100 miles. Of course this will depend on battery health, driving conditions, the environment and other factors. The Nissan Leaf starts with the push of a button and while lacking a combustion engine, it’s totally silent, which can be a bit of an adjustment considering there is no feedback indicating the car is running. The battery layout of the Leaf consists of forty eight lithium ion modules, each with four cells. Some are stacked vertically while others are horizontal under seats and other components to conserve valuable space. The batteries are designed for a long charging lifecycle and are guaranteed for eight years and 100,000 miles, but like any battery, as they are used the capacity begins to diminish. Despite all of those batteries, the Leaf is a spacious sedan with room for five and during my test drive we fit four good sized guys with camera gear very comfortably. Acceleration is tremendous and feels as if you stepped on the pedal of a handsomely equipped V-6. Delivering a battery output of 90kW, and an electric motor delivering 80kW drivers experience 100 percent torque at zero miles per hour. The biggest difference in the driving experience is the lack of vibration from an electric vehicle, literally smooth as silk. Now that we’ve put the pedal down, and gone zero to sixty, you will eventually need to stop this technological marvel. The Nissan Leaf implements a regenerative braking system which produces energy and stores that same energy in the battery modules. The system actually takes advantage of energy typically wasted in traditional vehicles and uses it to the car’s benefit. Now, after you mail that package, pick up the kids at school and grab some groceries for dinner, it will be time to replenish the charge on your Nissan Leaf. The charging port is located right under the front badge, and houses the normal and quick charging port all while being protected from the elements. The Leaf can also be equipped with an optional 12V solar panel that will assist with recharge and run some of the interior accessories. 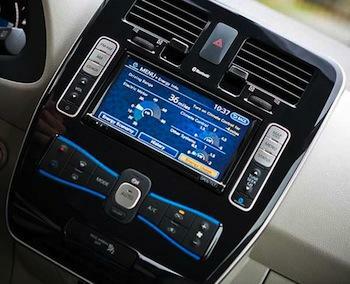 There are three ways to charge the Nissan Leaf, normal charge, quick charge and trickle charge. 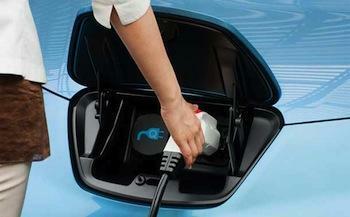 Normal charge consists of plugging your Leaf into the home charging port that is installed in your garage. The charging dock which uses a 220/240V dedicated line will fully charge a depleted battery in about seven hours, depending on amperage. The quick charge option on the SL model allows the driver to plug into a DC quick charge station and reach 80 percent capacity in about thirty minutes. Under the direction of the Department of Energy there are 400 DC fast charge stations planned for highway rest areas and downtown parking garages nationwide, although the program is initially only taking place in six states. Finally, trickle charge or opportunity charge, is delivered with a 110/120V trickle charge cable that allows the driver to plug into any standard outlet. This of course is the least convenient method as it takes about twenty hours to charge a depleted battery. Consider this the equivalent to topping off the gas tank. Nissan is also working with the government and private companies to develop a wide charging network for the future. you connected and will provide information such as remaining battery charge and drivable distance. With this mobile application you will always know your charging status, can be alerted with a text message when your Leaf is fully charged, and even set timers to charge your Leaf or adjust cabin climate. This is extremely useful in managing electric costs giving you the ability to charge at off peak hours. From inside the Leaf it is also easy to see your battery status and charging station locations with the Carwings powered navigational system. All this information can also be accessed via your computer utilizing the intuitive web portal. 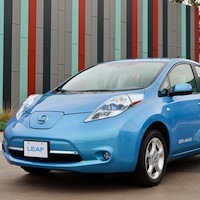 So, how much will it cost to charge the Leaf and drive 100 miles? 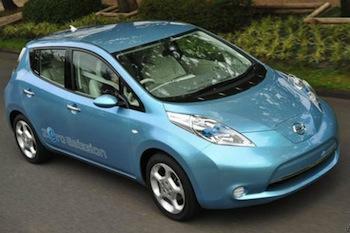 Well, the Leaf is based on a 24 kilowatt hour charge, so it really depends on your electricity costs. Here in California, I pay as little as eleven cents a kWh to a high or forty cents a kWh. At those rates it will cost me anywhere from $2.64 to $9.60 to travel 100 miles. Compare that to a similar sized sedan getting 25MPG, calculating gas at $4 per gallon, and the same 100 miles would cost you about $16 in gas. So what will all this economic and environmental goodness cost you at the dealership? Manufacturers suggested retail price on the Nissan Leaf SL, which is the premium of the two models is $33,720, minus federal tax savings of up to $7500 resulting in a real cost of about $26,220. This is comparable to similarly equipped mid size sedans. Nissan will also help out with installation of the home charging station that runs about $2000 before federal and state rebates. In the long run, the Nissan Leaf and other alternative fuel vehicles will lessen our dependance on foreign oil and lead to a cleaner environment, all resulting in a higher quality of life for everyone. In conclusion, I must say, I grew up in the muscle car era with loud gas guzzling V8 engines and was very skeptical about non gas powered vehicles. After driving the Nissan Leaf and speaking to the representatives that engineered this piece of technology, I’m a believer in alternative fuels for transportation. Is there still work to be done? Of course, in a country as large as the United States we need to be able to travel more than 100 miles at a time, but let’s face it, you need to start somewhere and this is a great start. TechnoBuffalo readers I want to get your feelings on alternative fuel vehicles and how you think they will evolve in the future. Are you excited about the possibilities? Are you still in the “show me it’s feasible” crowd? I want to hear your thoughts in the comments below.